Here's a soft, supple style of Napa Cab that's very approachable. The flavor and texture profile is open and relaxed. It's ready to enjoy now and should prove to be versatile with food. This was the case on Thanksgiving, as our magnum disappeared quickly. I paid $100 for the 1.5L format which always makes the table more festive. Raise a glass! I don't often say this about Napa Cabernet, but put this one away for a long, long time. It's a bit closed and muted, but shows a density and depth that will probably take some time to reveal. In fact, we sipped on this wine for several hours and it didn't seem to evolve much. Just a little bit was left in the bottle when I put a stopper on it and returned it to the cellar overnight. The next evening, I poured the last of the bottle and it was remarkably more open. This is fairly uncommon and tells me this wine is very slow to evolve. I grabbed this bottle for $45, although it usually retails for more. Raise a glass- later on! This is a very good Syrah with a lot going on. While there's a big peppery explosion on the front, there's plenty of rich fruit to round it out. The Santa Ynez Valley in California is situated just North of Santa Barbara. If you're interested in Syrah, get to know this area. The Syrah made here can be out of this world. I paid $20 for this wine and bought a half case. The first bottle paired perfectly with a friend's homemade buffalo chicken mac'n cheese. Raise a glass! Finish: berry burst on the finish. 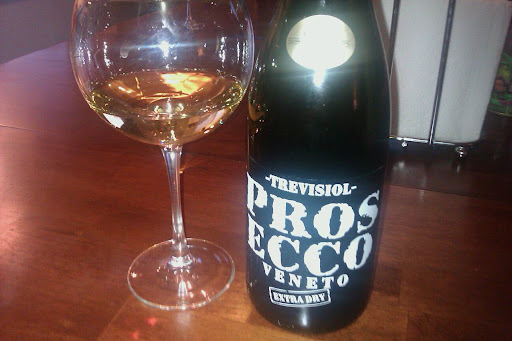 Overall: an ok prosecco and an inexpensive before turkey Thanksgiving drink. If you are looking for a very good write up on Thanksgiving Day wines and how to make that last minute selection, see this post by NW. If, however, you have alternate dietary requirements, whether by choice or by necessity, read on. All in all there are many reasons to be thankful this year. These three wines will be a delightful addition to the vegetarian meal. Raise a Glass! Overall: I paid about $12 for this Beaujolais Nouveau at the local store. It should be widely available. Celebrate new wine with this new wine. Let it breathe and the acid structure will soften. On Thanksgiving day, many wines will work just fine. If you have a big casual group of people, make sure to have several wines including at least one red and one white. For a smaller gathering and a more formal meal, serve a red wine at the table that's versatile. My top pick is still Cabernet Sauvignon with a little bit of age on it. Even more specific, I'd go for a Sonoma County wine or a Napa Valley producer who's focused on a more refined Cabernet style. Other wine regions such as Paso Robles, CA, Columbia Valley, WA, and Walla Walla, WA, also produce Cabernets and Cabernet blends that would be fitting. In the spirit of a uniquely American holiday, serve American wine. There are plenty of other opportunities to open your Bordeaux. You might be surprised that my top pick isn't Pinot Noir, but I find that all the wonderful subtleties of a good Pinot are washed away in the Thanksgiving day meal. In any case, don't take wine and food pairings too seriously on Thanksgiving. With the variety of flavors involved and the number of side dishes that grace most tables, versatility is key. I will be pouring a beautiful Cabernet. As I write this my turkey is thawing (Saturday prior to the big feast) and I will certainly brine my bird and then fantasize about all the wonderful wines--both reds and whites, bold ones and more finessed ones which will be served up during the multi-course celebration. As you will find when reading (NW's) post from a previous year, whatever you do, don't think, "Turkey= poultry= white wine." If you do, you will miss out on the best this day has to offer--gastronomically speaking! Grabbed this from Trader Joe's for $12 and this one is pale yellow with a wonderful pronounced, grassy, grapefruit and guava paste bouquet that provokes salivation. Palate--Solid grassy, citrusy, grapefruity, Sauvignon Blanc flavors on a foundation of racy acidity that will cut any grease, butter, or fat right off your palate as you eat. 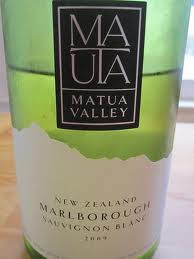 This is classic New Zealand (Marlborough) Sauvignon Blanc and is a good food wine especially with heavy buttery foods. Raise a glass! Made for Sam's Club, the Torre's family, with great reputation intact, produces this wine and distributes it for a value price of under $8. It is purple and young with ample sour cherry with sweet red fruit along side. Palate--Pepper with tight fruit that needs plenty of time to open. It packs a lot of flavor even with subdued red berry fruit trying to break out. It is well made as one would expect from the Torre's family. I cut my oenophilic teeth on Torres wines and still have fond memories of well made wines and value pricing. Some things never change so raise a glass! Gentle bouquet with an off odor of petroleum or Kerosene. It is slight but it is there! It dissipates fortunately leaving and off dry, citrus with generic fruit. This wine is unremarkable and should be passed up. 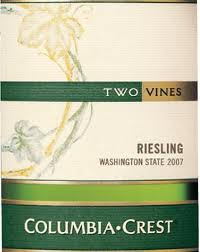 Columbia Crest normally makes great value wines but this one is an exception so raise a glass to something else. This New Zealand Marlborough wine is pale gold with a tinge of green. Bouquet is sweet, powdery, grassy, tropical fruit, pineapple, pears and loads of grapefruit with some air. Palate--Sweet, off dry, fruity, tasty, more grapefruit and short but a nice value at $6. Another Trader Joe's value wine so raise a glass. Classic Gamay light purple/cherry hue with substantial aromas of candy apple, sweet cherry and strawberry hints. Palate: A tad tart with a slight puckery dryness that makes you smack your lips. The wonderful berry aromas on the nose are scant on the palate. The aftertaste has a "beer" like quality to it--seriously. Well, with Nouveau you have to take what you get. 2005 was one of the best Nouveaus in memory and 2007 as well as 2008 were also quite delicious. This 2010 is one of the lesser examples I have had in several years. Bummer. Try another negociant and see what you get! Raise a glass--of a different Nouveau! Reviewed previously this very inexpensive Pinot is a bargain out of the gate. It presents with a classy light cherry hue and classic Pinot aromas of light raspberry and strawberry juice that is simple and pure. Palate--really flavorful with nice structure, solid balance and wonderful Pinot Noir flavors with some richness in the bright red berry flavors. This is the kind of VALUE wine you look for to stock up on at the $10 price point. For a pinot that tastes like Pinot, this is a buy more wine which I already have so raise a glass. As a wine, Nouveau is never much to anticipate beyond the sheer, simple quaffing pleasure of this beautifully hued, simply made wine from the Gamay grape with no pretensions of being great, complex or remarkable beyond the event. It is picked, made and bottled within 6 weeks and shipped all over the world so the timing is just right! 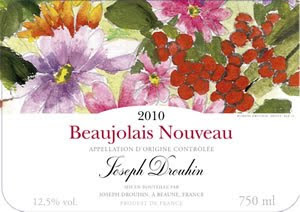 The best years for Nouveau yields a wine that is straight forward, wonderfully fruity, with pleasant raspberry or strawberry suggestions and down right refreshing with a light chill on it. It goes will all kinds of appetizers and munchies that aren't too elaborately spiced or is just plain good to sip or guzzle next to a nice fire. This is an excellent dessert wine and delicious even in its youth. 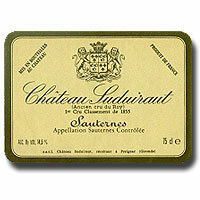 Sauternes can often age for generations, and has proven to cellar for even 200 years. I'm always amazed by the stuff because it has an intense sweetness but never seems heavy. Although this one was served a bit young, it proved to be smooth, rich, and well integrated. I always like to have a few half bottles on hand and this is one to look for in the 375mL format. It runs about $40 for the half and $80 for the full bottle. Serve up a bottle of Sauternes like this as a way to wind down the Thanksgiving meal. And raise a glass! Summary: This wine delivers a softer Cabernet Sauvignon profile, but is still full bodied and richly perfumed. It's well integrated and easy to drink. I recommend it as a very approachable Cabernet. At a recent business dinner, my table polished off a magnum before the meal even arrived. We paid $175 for a magnum at the restaurant and a 750mL bottle runs about $45 in the store. Raise a glass! Palate: crisp with delightful acid core. Citrussy notes and peachy character. Overall:Thanks to Amy from Colangelo & Partners PR for thinking of us at The Wine Cask Blog and providing us the samples to review. 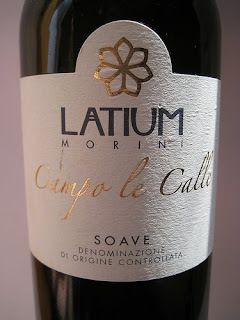 This Soave wine is 100% Garganega grapes. According to research the Garganega grapes are dried for several days before wine making beings. This concentrates the flavors and sugars and brings out the honey notes in this delightful white wine. It will pair well with holiday meals and provide a very nice alternative that white your uncle pulled out from under the cabinet. I have seen this 2009 Latium Soave available online for anywhere from $12-$20 which is a very reasonable price. Another Trader Joe's nice wines--this one earned the Wine Enthusiast's 90 point "Best Buy" rating. I can go along with the best buy but right now this wine is still too young. Watch out in a couple more years! This wine is young with a purple hue and deeply fruity with licorice/anise/fennel, ripe prune hints but not over done. Palate--Sweet (of course) ripe prunes, a bit harsh, grapey but nicely textured with a silky presence, licorice and light black pepper. I paid $13 at Trader Joe's and would buy another so raise a glass. Remember--do NOT confuse a "Late Bottled Vintage Port" with "Vintage Port." They are two different animals and I assure you two vastly different price points! The Quarles Harris 2007 "Vintage Porto" by the way--is spectacular and is a STEAL at $35! Feudo Arancio knows how to make Nero D'Avola--they should concentrate on that and leave the Pinot alone--at least in this 2008. It has a black cherry hue with aromas that are pleasant but not varietal. Floral cherry licorice notes. Palate--Soft, lifeless again--atypical as a Pinot Noir but easy enough to drink. Even at $8, I'd pass on this Pinot! Finally--we have a Trader Joe's in our state of Maine. While I am a big fan of TJ's wine selection and pricing, this one is pretty disappointing by way of both selection and pricing. This Chianti Riserva--I assume made for Trader Joe's perhaps or at least is bought in bulk by TJ's is $6. What do you get for $6? A decent garnet hue wine with cherry, evergreen and licorice aromas with a nice Sangiovese bouquet! Palate--Cedar and cherry with dried cherry flavors that tastes remarkably like a Tuscan Sangiovese. This was a pleasant surprise and at $6, this IS a BUY MORE kind of wine so raise a glass. 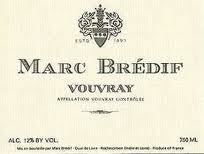 I am a fan of Chenin Blanc and Vouvray means Chenin. Straw hue with pronounced aromas of Meyer Lemon with lime citrusy, cream notes. Ripe pineapple with slight caramel hint. Really nice! Palate: Racy acidity with lime galore. Citrus peel with a nice finish and a creamy texture. This is a very nice Chenin that works as an aperitif but also paired well with a seafood risotto I whipped up. I paid $15 for this at Rapid Liquors in Stoneham, Mass. My favorite wine store in New England! I paid $15 for this which is a GOOD price so raise a glass! From time to time we at The Wine Cask Blog receive wine related objects to review. Click here to see PB's double-blind review of the glass. This is one such object and a very unique one at that. 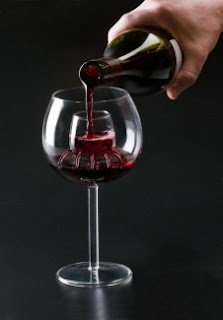 The Chevalier Aerating Wine Glass is a beautiful full size wine glass with a unique, perforated bowl on a stem in the center of the main bowl. As you pour your wine into the small center bowl, the perforations allow the wine to cascade into the main bowl. The idea is that as the wine is split and fountains into the main bowl, its surface area increases thereby increasing its exposure to the air. Most reds and many white wines improve with exposure to air. This is called "breathing" the wine and is one reason why many wines are decanted prior to serving. 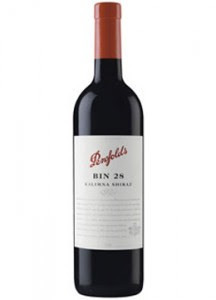 I decided to review the glass with a wine I've not tasted before: Penfold's Bin 28 2006 Kalimna Shiraz from Southern Australia. I selected this wine because I typically like Shiraz to breathe before drinking it and because I did not have any predispositions for or against this wine. Palate: smooth and round with plush tannins and a soft acid core. Finish: long and even with dried sage, blackberry and more chocolate notes. Palate: sharp acids followed by plush tannins for a warm core. Glass 1 was the Chevalier aerated wine and glass 2 was the wine poured straight from the bottle. Overall: As this test shows the Chevalier wine glass works. It quickly opens up and softens the wine. This process would otherwise require decanting and/or an hour or so of breathing. That said, there is one drawback to the glass. The glass is a bit thicker than a traditional crystal wine glass. The lip of the glass, especially, is thick and bulky. It doesn't feel great on my lips. However the time savings in getting a great, pre-breathed glass of hearty red makes up for either the un-elegance of a thicker glass or the bother of pouring it into another glass. This would make an interesting and fun gift for the wine lover in your life and a conversation piece during the holidays. The folks at Chevalier Collection LTD. sent this new patent pending aerating wine glass to the WCB for evaluation. This hand blown, lead free glass will accommodate 7 ounces of wine. The folks at Chevalier say that this has been proven "scientifically" to aerate wine. Maybe a word of explanation here is prudent: Most red wines do in fact improve as they are open to the air to "breathe." In fact even some white wines also improve with some exposure to air. This exposure in a sense forces a maturational process of the chemistry of the wine giving it a better, fuller flavor. To do this is objectively as possible I poured a white Burgundy into the aerating glass and then transferred the wine into my standard tasting glass. Although this glass is designed to drink right from the same glass, I wanted to make sure the aerated and unaerated wines were tasted with the same conditions meaning the same glass. My wife served the aerated white and the unaerated white to me blind. I then recorded the bouquet of each wine and selected which I thought was a fuller bouquet hence aerated. Then I tasted each wine and recorded the review as well as which I thought was the aerated wine being more "open" and better tasting. In both cases, I was right on all counts showing that the aerating glass in fact DOES improve the wine effectively aerating it as it is poured. Hats off to the folks at Chevalier! I do not know what this glass will cost and as a down side of sorts, I don't know how many people will want to drink their wine out of a glass that is a bit "clunky." But I can say without equivocation that the Legacy Wine Glass does work! So raise a glass of aerated wine!